This article is about the food preparation method. 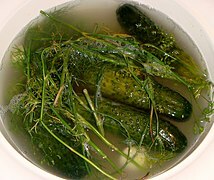 For the food created using this method commonly called "pickles" in the United States and Canada, see pickled cucumber. For the treatment of metallic surfaces, see Pickling (metal). Pickling is the process of preserving or extending the lifespan of food by either anaerobic fermentation in brine or immersion in vinegar. In East Asia, vinaigrette (vegetable oil and vinegar) is also used as a pickling medium. The pickling procedure typically affects the food's texture, taste and flavor. The resulting food is called a pickle, or, to prevent ambiguity, prefaced with pickled. Foods that are pickled include vegetables, fruits, meats, fish and eggs. A distinguishing characteristic is a pH of 4.6 or lower, which is sufficient to kill most bacteria. Pickling can preserve perishable foods for months. Antimicrobial herbs and spices, such as mustard seed, garlic, cinnamon or cloves, are often added. If the food contains sufficient moisture, a pickling brine may be produced simply by adding dry salt. For example, sauerkraut and Korean kimchi are produced by salting the vegetables to draw out excess water. Natural fermentation at room temperature, by lactic acid bacteria, produces the required acidity. Other pickles are made by placing vegetables in vinegar. Like the canning process, pickling (which includes fermentation) does not require that the food be completely sterile before it is sealed. The acidity or salinity of the solution, the temperature of fermentation, and the exclusion of oxygen determine which microorganisms dominate, and determine the flavor of the end product. The exact origins of pickling are unknown, but it may have begun in the area of Mohenjo Daro, in the northwest of the Indian subcontinent, about 2400 B.C. Pickling was used as a way to preserve food for out-of-season use and for long journeys, especially by sea. Salt pork and salt beef were common staples for sailors before the days of steam engines. Although the process was invented to preserve foods, pickles are also made and eaten because people enjoy the resulting flavors. Pickling may also improve the nutritional value of food by introducing B vitamins produced by bacteria. The term pickle is derived from the Dutch word pekel, meaning brine. In the U.S. and Canada, and sometimes Australia and New Zealand, the word pickle alone almost always refers to a pickled cucumber, except when it is used figuratively. It may also refer to other types of pickles such as "pickled onion", "pickled cauliflower", etc. In the UK, pickle, as in a "cheese and pickle sandwich", may also refer to Ploughman's pickle, a kind of chutney. South Asia has a large variety of pickles (known as achar (अचार) in Nepali, Assamese, Bengali, Hindi, Punjabi, Urdu uppinakaayi in Kannada, lonacha (लोणचं) in Marathi, uppilittathu or achar in Malayalam, oorukai in Tamil, ooragaya in Telugu), which are mainly made from varieties of mango, lemon, lime, goongura (a sour leafy shrub), tamarind and Indian gooseberry (amla), chilli. Vegetables such as eggplant, carrots, cauliflower, tomato, bitter gourd, green tamarind, ginger, garlic, onion, and citron are also occasionally used. These fruits and vegetables are generally mixed with ingredients like salt, spices, and vegetable oils and are set to mature in a moistureless medium. In Sri Lanka, achcharu is traditionally prepared from carrots, onions, and ground dates that are mixed with mustard powder, ground pepper, crushed ginger, garlic, and vinegar, and left to sit in a clay pot. Singapore, Indonesian and Malaysian pickles, called acar, are typically made out of cucumber, carrot, bird's eye chilies, and shallots, these items being seasoned with vinegar, sugar and salt. Fruits, such as papaya and pineapple, are also sometimes pickled. In the Philippines, pickling was traditionally done in earthen jars and is widely known as buro or binuro. Pickling was a common method of preserving food throughout the archipelago before the advent of refrigeration, but its popularity is now confined to vegetables and fruits. Achara remains popular as the Philippine localization of the Malay acar, and is primarily made out of green papaya, carrots, and shallots, seasoned with cloves of garlic and vinegar; but could include ginger, bell peppers, white radishes, cucumbers or bamboo shoots. Pickled unripe mangoes or burong mangga, unripe tomatoes, guavas, jicama, bitter gourd and other fruit and vegetables still retain their appeal. Siling labuyo, sometimes with garlic and red onions, is also pickled in bottled vinegar and is a staple condiment in Filipino cuisine. In Vietnamese cuisine, vegetable pickles are called dưa muối ("salted vegetables") or dưa chua ("sour vegetables"). Dưa chua or dưa góp is made from a variety of fruits and vegetables, including cà pháo, eggplant, Napa cabbage, kohlrabi, carrots, radishes, papaya, cauliflower, and sung. Dưa chua made from carrots and radishes are commonly added to bánh mì sandwiches. Dưa cải muối is made by pressing and sun-drying vegetables such as cải bẹ xanh and bok choy. Nhút mít is a specialty of Nghệ An and Hã Tĩnh provinces made from jackfruit. In Burma, tea leaves are pickled to produce lahpet, which has strong social and cultural importance. China is home to a huge variety of pickled vegetables, including radish, baicai (Chinese cabbage, notably suan cai, la bai cai, pao cai, and Tianjin preserved vegetable), zha cai, chili pepper, and cucumbers, among many others. Japanese tsukemono (pickled foods) include takuan (daikon), umeboshi (ume plum), gari & beni shōga (ginger), turnip, cucumber, and Chinese cabbage. The Korean staple kimchi is usually made from pickled napa cabbage and radish, but is also made from green onions, garlic stems, chives and a host of other vegetables. Kimchi is popular throughout East Asia. Jangajji is another example of pickled vegetables. In Iran, Turkey, Arab countries, the Balkans, and the Caucasus, pickles (called torshi in Persian, turşu in Turkish language and mekhallel in Arabic) are commonly made from turnips, peppers, carrots, green olives, cucumbers, cabbage, green tomatoes, lemons, and cauliflower. Sauerkraut, as well as cabbage pickled in vinegar, with carrot and other vegetables is commonly consumed as a kosher dish in Israel and is considered pareve, meaning that it contains no meat or dairy so it can be consumed with either. In Hungary the main meal (lunch) usually goes with some kind of pickles (savanyúság) but they are commonly consumed at other times of the day too. The most commonly consumed pickles are sauerkraut (savanyú káposzta), the different kinds of pickled cucumbers and peppers and csalamádé but tomatoes, carrots, beetroot, baby corn, onions, garlic, certain squashes and melons and a few fruits like plums and apples are used to make pickles too. Stuffed pickles are specialties usually made of peppers or melons pickled after being stuffed with a cabbage filling. Pickled plum stuffed with garlic is a unique Hungarian type of pickle just like csalamádé and leavened cucumber (kovászos uborka). Csalamádé a type of mixed pickle made of cabbage, cucumber, paprika, onion, carrot, tomatoes and bay leaf mixed up with vinegar as the fermenting agent. Leavened cucumber, unlike other types of pickled cucumbers that are around all year long, is rather a seasonal pickle produced in the summer. Cucumbers, spices, herbs and slices of bread are put in a glass jar with salt water and kept in direct sunlight for a few days. The yeast from the bread, along with other pickling agents and spices fermented under the hot sun, give the cucumbers a unique flavor, texture and slight carbonation. Its juice can be used to make a special type of spritzer ('Újházy fröccs') instead of carbonated water. It is common for Hungarian households to produce their own pickles. Different regions or towns have their special recipes unique to them. 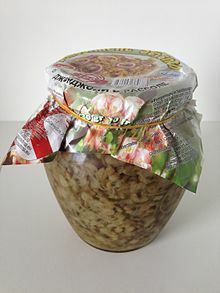 Among them all the Vecsési sauerkraut (Vecsési savanyú káposzta) is the most famous. Romanian pickles (murături) are made out of beetroot, cucumbers, green tomatoes (gogonele), carrots, cabbage, garlic, sauerkraut (bell peppers stuffed with cabbage), bell peppers, melons, mushrooms, turnips, celery and cauliflower. Meat, like pork, can also be preserved in salt and lard. Polish, Czech and Slovak traditional pickles are cucumbers and sauerkraut, but other pickled fruits and vegetables, including plums, pumpkins and mushrooms are also common. Russian, Ukrainian and Belarusian pickled items include beets, mushrooms, tomatoes, sauerkraut, cucumbers, ramsons, garlic, eggplant (which is typically stuffed with julienned carrots), custard squash, and watermelon. Garden produce is commonly pickled using salt, dill, blackcurrant leaves, bay leaves and garlic and is stored in a cool, dark place. The leftover brine (called rassol (рассол) in Russian) has a number of culinary uses in these countries, especially for cooking traditional soups, such as shchi, rassolnik, and solyanka. Rassol, especially cucumber or sauerkraut rassol, is also a favorite traditional remedy against morning hangover. In Albania, Bulgaria, Serbia, Macedonia and Turkey, mixed pickles, known as turshi, tursija or turshu form popular appetizers, which are typically eaten with rakia. Pickled green tomatoes, cucumbers, carrots, bell peppers, peppers, eggplants, and sauerkraut are also popular. In Greece, pickles, called τουρσί(α), are made out of carrots, celery, eggplants stuffed with diced carrots, cauliflower, tomatoes, and peppers. In Britain, pickled onions and pickled eggs are often sold in pubs and fish and chip shops. Pickled beetroot, walnuts, and gherkins, and condiments such as Branston Pickle and piccalilli are typically eaten as an accompaniment to pork pies and cold meats, sandwiches or a ploughman's lunch. Other popular pickles in the UK are pickled mussels, cockles, red cabbage, mango chutney, sauerkraut, and olives. Rollmops are also quite widely available under a range of names from various producers both within and out of the UK. 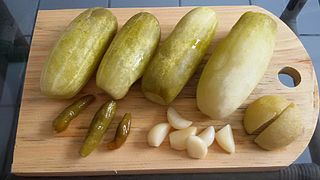 In the United States and Canada, pickled cucumbers (most often referred to simply as "pickles" in Canada and the United States), olives, and sauerkraut are most commonly seen, although pickles common in other nations are also available. Canadian pickling is similar to that of Britain. Through the winter, pickling is an important method of food preservation. Pickled cucumbers, onions, and eggs are common individual pickled foods seen in Canada. Chow-chow is a tart vegetable mix popular in the Maritime Provinces and the Southern United States, similar to piccalilli. Pickled fish is commonly seen, as in Scotland. Meat is often also pickled or preserved in different brines throughout the winter, most prominently in the harsh climate of Newfoundland. Giardiniera, a mixture of pickled peppers, celery and olives, is a popular condiment in Chicago and other cities with large Italian-American populations, and is often consumed with Italian beef sandwiches. Pickled eggs are common in the Upper Peninsula of Michigan. Pickled herring is available in the Upper Midwest. Pennsylvania Dutch Country has a strong tradition of pickled foods, including chow-chow and red beet eggs. In the Southern United States, pickled okra and watermelon rind are popular, as are deep-fried pickles and pickled pig's feet, pickled chicken eggs, pickled quail eggs, pickled garden vegetables and pickled sausage. In Mexico, chili peppers, particularly of the Jalapeño and serrano varieties, pickled with onions, carrots and herbs form common condiments. Various pickled vegetables, fish, or eggs may make a side dish to a Canadian lunch or dinner. Popular pickles in the Pacific Northwest include pickled asparagus and green beans. 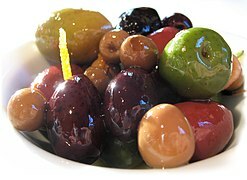 Pickled fruits like blueberries and early green strawberries are paired with meat dishes in restaurants. In the United States, National Pickle Day is recognized as a food "holiday" every year on November 14. In the Mesoamerican region pickling is known as "encurtido" or "curtido" for short. The pickles or "curtidos" as known in Latin America are served cold, as an appetizer, as a side dish or as a tapas dish in Spain. In several Central American countries it is prepared with cabbage, onions, carrots, lemon, vinegar, oregano, and salt. In Mexico, "curtido" consists of carrots, onions, and jalapeño peppers and used to accompany meals still common in taquerias and restaurants. In order to prepare a carrot "curtido" simply add carrots to vinegar and other ingredients that are common to the region such as chilli, tomato, and onions. Varies depending on the food, in the case of sour. Another example of a type of pickling which involves the pickling of meats or seafood is the "escabeche" or "ceviches" popular in Peru, Ecuador, and throughout Latin America and the Caribbean. These dishes include the pickling of pig's feet, pig's ears, and gizzards prepared as an "escabeche" with spices and seasonings to flavor it. The ceviches consists of shrimp, octopus, and various fishes seasoned and served cold. In traditional pickling, fruit or vegetables are submerged in brine (20-40 grams/L of salt (3.2–6.4 oz/imp gal or 2.7–5.3 oz/US gal)), or shredded and salted as in sauerkraut preparation, and held underwater by flat stones layered on top. Alternatively, a lid with an airtrap or a tight lid may be used if the lid is able to release pressure which may result from carbon dioxide buildup. 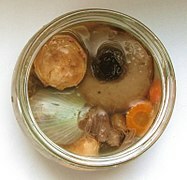 Mold or (white) kahm yeast may form on the surface; kahm yeast is mostly harmless but can impart an off taste and may be removed without affecting the pickling process. 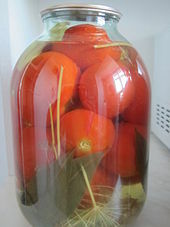 In chemical pickling, the fruits or vegetables to be pickled are placed in a sterilized jar along with brine, vinegar, or both, as well as spices, and are then allowed to mature until the desired taste is obtained. The food can be pre-soaked in brine before transferring to vinegar. This reduces the water content of the food, which would otherwise dilute the vinegar. This method is particularly useful for fruit and vegetables with a high natural water content. In commercial pickling, a preservative such as sodium benzoate or EDTA may also be added to enhance shelf life. In fermentation pickling, the food itself produces the preservation agent, typically by a process involving Lactobacillus bacteria that produce lactic acid as the preservative agent. Alum is used in pickling to promote crisp texture and is approved as a food additive by the United States Food and Drug Administration. "Refrigerator pickles" are unfermented pickles made by marinating fruit or vegetables in a seasoned vinegar solution. They must be stored under refrigeration or undergo canning to achieve long-term storage. Japanese Tsukemono use a variety of pickling ingredients depending on their type , and are produced by combining these ingredients with the vegetables to be preserved and putting the mixture under pressure. The World Health Organization has listed pickled vegetables as a possible carcinogen, and the British Journal of Cancer released an online 2009 meta-analysis of research on pickles as increasing the risks of esophageal cancer. The report, citing limited data in a statistical meta analysis, indicates a potential two-fold increased risk of oesophageal cancer associated with Asian pickled vegetable consumption. Results from the research are described as having "high heterogeneity" and the study said that further well-designed prospective studies were warranted. However, their results stated "The majority of subgroup analyses showed a statistically significant association between consuming pickled vegetables and Oesophageal Squamous Cell Carcinoma". The 2009 meta-analysis reported heavy infestation of pickled vegetables with fungi. Some common fungi can facilitate the formation of N-nitroso compounds, which are strong oesophageal carcinogens in several animal models. Roussin red methyl ester, a non-alkylating nitroso compound with tumour-promoting effect in vitro, was identified in pickles from Linxian in much higher concentrations than in samples from low-incidence areas. Fumonisin mycotoxins have been shown to cause liver and kidney tumours in rodents. A 2017 study in Chinese Journal of Cancer has linked salted vegetables (common among Chinese cuisine) to a fourfold increase in nasopharynx cancer, where fermentation was a critical step in creating nitrosamines, which some are confirmed carcinogens, as well as activation of Epstein–Barr virus by fermentation products. Historically, pickling caused health concerns for reasons associated with copper salts, as explained in the mid-19th century The English and Australian Cookery Book: "The evidence of the Lancet commissioner (Dr. Hassall) and Mr. Blackwell (of the eminent firm of Crosse and Blackwell) went to prove that the pickles sold in the shops are nearly always artificially coloured, and are thus rendered highly unwholesome, if not actually poisonous." ^ Chou, Lillian. "Chinese and Other Asian Pickles". Flavor and Fortune (Fall 2003 Volume). Institute for the Advancement of the Science And Art Of Chinese Cuisine. Retrieved 6 December 2012. ^ "Pickle Bill Fact Sheet". 13 March 2008. Archived from the original on 13 March 2008. Retrieved 15 February 2018. ^ Rhee, MS; Lee, SY; Dougherty, RH; Kang, DH (2003). 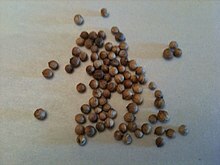 "Antimicrobial effects of mustard flour and acetic acid against Escherichia coli O157:H7, Listeria monocytogenes, and Salmonella enterica serovar Typhimurium". Appl Environ Microbiol. 69 (5): 2959–63. doi:10.1128/aem.69.5.2959-2963.2003. PMC 154497. PMID 12732572. ^ a b McGee, Harold (2004). On Food and Cooking: The Science and Lore of the Kitchen. New York: Scribner, pp. 291–296. ISBN 0-684-80001-2. ^ "Pickles Throughout History". Retrieved 15 February 2018. ^ "Science of Pickles: Fascinating Pickle Facts - Exploratorium". Exploratorium: the museum of science, art and human perception. Retrieved 15 February 2018. ^ "Sweet & Spicy Pickled Vegetables". chabad.org. ^ Zeldes, Leah A. (2009-12-02). "Eat this! Southern-fried dill pickles, a rising trend". Dining Chicago. Chicago's Restaurant & Entertainment Guide, Inc. Retrieved 2010-08-02. ^ "Pickled Pigs Feet Recipe - Real Authentic Pigs Feet Recipes". Retrieved 15 February 2018. ^ "All Pickle Types". thenibble.com. Retrieved 2015-01-22. ^ a b c Islami, F (2009). "Pickled vegetables and the risk of oesophageal cancer: a meta-analysis". British Journal of Cancer. 101 (9): 1641–1647. doi:10.1038/sj.bjc.6605372. PMC 2778505. PMID 19862003. Retrieved 2013-05-14. ^ Li, MH; Ji, C; Cheng, SJ (1986). "Occurrence of nitroso compounds in fungi‐contaminated foods: A review". Nutrition and Cancer. 8 (1): 63–69. doi:10.1080/01635588609513877. ^ Liu, J. G.; Li, M. H. (1989). "Roussin red methyl ester, a tumor promoter isolated from pickled vegetables". Carcinogenesis. 10 (3): 617–620. doi:10.1093/carcin/10.3.617. PMID 2494003. ^ "Study: Salted vegetables increase risk of nose cancer". 16 January 2017. Retrieved 15 February 2018. ^ "Health". Retrieved 15 February 2018. Wikimedia Commons has media related to Pickled food.